Despite President Poroshenko intention to bring about a ceasefire, Kiev’s relentless military operation in the country's east is intensifying. 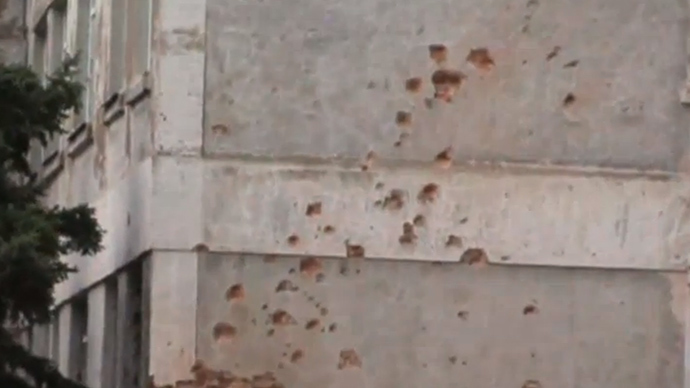 Slavyansk has become one of the main targets of artillery attacks, amateur videos filmed in the area show. "We must reach a ceasefire this week. Each day when people are dying, each day when Ukraine pays such a high price is unacceptable for me," newly sworn-in President Petro Poroshenko said on June 8 after trilateral talks on eastern Ukraine with Russian and OSCE representatives. 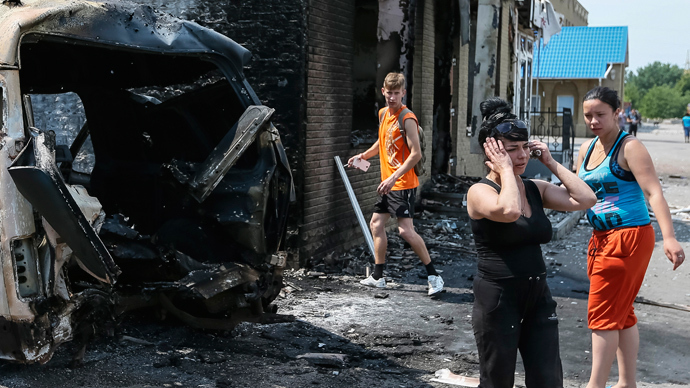 Still, constant fire is heard in the evening hours in residential areas of Slavyansk, with frustrated people seeking shelter when the shelling erupts. A woman is heard asking a man where it's safe to hide. 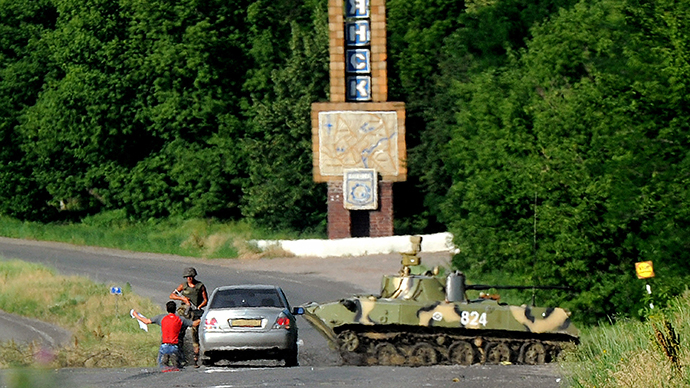 Kiev's artillery has been firing on Slavyansk since mid-May, and the city's residential areas suffer most under the attacks. A multi-storeyed apartment block is seen damaged in the video, another residential house's roof is on fire. A woman is heard yelling, accusing the western press of lying, "they say that civilians do not suffer," she says. Locals have told RT they have been without running water and power for days. Remains of what was a shopping area are seen in the video. Signs read various shops' names, including a travel agency and tickets sales office, and people in the street are trying to retrieve what's left of a household appliances shop. The man behind the camera films an address sign as proof of location. A destroyed gas-station across the street. Although the area has an abandoned feel, especially for a Sunday, a local woman carrying bags crosses the ghostly street. Shells leave craters about two meters wide on pavements and in the ground. The video is captioned "Poroshenko's present to Slavyansk for Pentecost". Pentecost Sunday, or the Holy Trinity Day is one of the main Christian holidays. Indiscriminate fire hit residential buildings, schools and hospitals on June 8. A leisure center in the video is still on fire. A man is asking to film the surroundings, as he says "otherwise no one will later believe that such a thing could be possible". 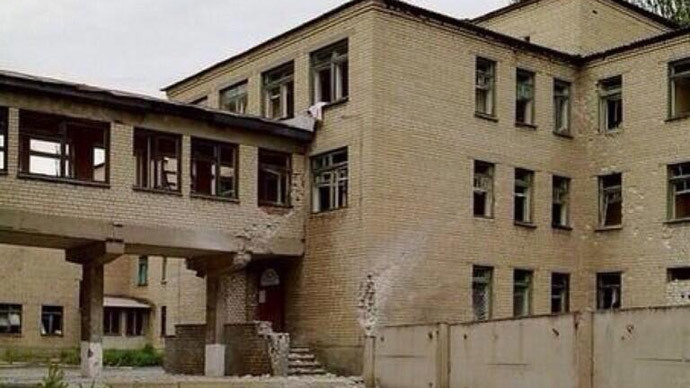 At least five people were reported killed as the result of the shelling of Slavyansk on Sunday. A girl, thought to be four years old, was among dead. She is thought to have perished in the fire at the leisure center. The video shows the Andreevsky merchants' house, one of the oldest historical buildings in Slavyansk, which was set ablaze and destroy by the attack. In the military operation, some homes were totally demolished. The man in the video below now has to live in a cellar. "This is where we live, children and women live here, eat here," he says. A piece of roof is hanging atop a nearby tree, his yard is now total wreckage.